Dutch jurist and minister of justice; born at Amsterdam Jan. 13, 1814; died at Würzburg June 27, 1882. He devoted himself to the study of jurisprudence, and at a very early age secured employment under the state. When but thirty-two, upon the death of Boas, he became by royal appointment judge of the provincial court for North Holland; and two years later (1848) he was elected in the city of Amsterdam a member of the second chamber of the States General of the Netherlands, which position he held until the year 1881. In 1860 he prepared a new code of judicial practise and procedure; this was adopted, and in recognition of his labors thereon the king decorated him with the cross of the Order of the Netherlands Lion. On several occasions at the formation of ministries he had been offered a portfolio, but had each time declined, until in Feb., 1860, the king himself joining the finance minister, Van Hall, in soliciting Godefroi to aid in the formation of a cabinet, he accepted the ministry of justice. He has the distinction of being the first Jew to fill a cabinet position in Holland, and this is the more noteworthy since he was a consistent and outspoken adherent of his faith, occupying the prominent position of president of the Jewish consistory and having been a member of the Institut zur Förderung Israelitischer Literatur during the eighteen years of its existence. Godefroi in his public life was a very ardent friend of his people. At one time he exposed in the chamber the abuses of the missionary efforts in Amsterdam, and protested vigorously against the excesses of the proselytizing zealots. As minister of justice he contributed greatly toward securing the emancipation of the Jews in Switzerland; the commercial treaty between the Netherlands and Switzerland was not ratified until assurance had been given of the establishment of the legal equality of Jews and Christians in the latter country. 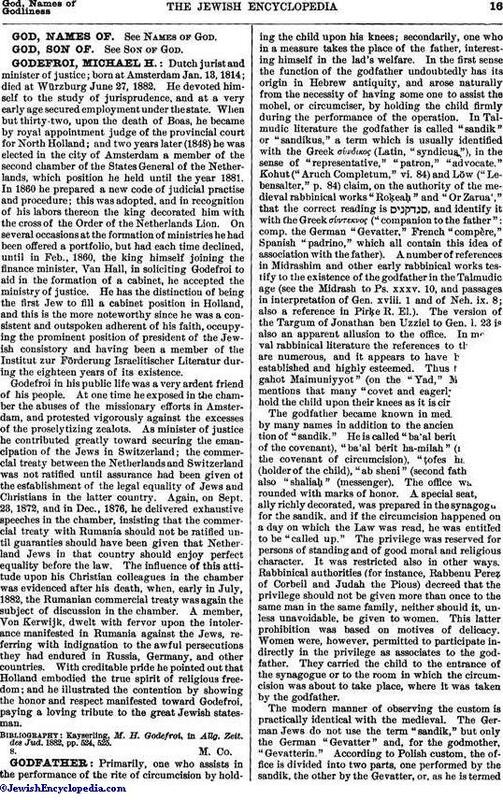 Again, on Sept. 23, 1872, and in Dec., 1876, he delivered exhaustive speeches in the chamber, insisting that the commercial treaty with Rumania should not be ratified until guaranties should have been given that Netherland Jews in that country should enjoy perfect equality before the law. The influence of this attitude upon his Christian colleagues in the chamber was evidenced after his death, when, early in July, 1882, the Rumanian commercial treaty was again the subject of discussion in the chamber. A member, Von Kerwijk, dwelt with fervor upon the intolerance manifested in Rumania against the Jews, referring with indignation to the awful persecutions they had endured in Russia, Germany, and other countries. With creditable pride he pointed out that Holland embodied the true spirit of religious freedom; and he illustrated the contention by showing the honor and respect manifested toward Godefroi, paying a loving tribute to the great Jewish statesman. Kayserling, M. H. Godefroi, in Allg. Zeit. des Jud. 1882, pp. 524, 525.